A return for both of us: me in a small way having visited briefly over 15 years ago; Sarah in a bigger way having worked here before. Unsurprisingly, much has changed. Driving in from Changi airport the skyline has changed dramatically, particularly down at Marina Bay Sands, where a triple tower set up boasts what appears to be a full size container ship perched on top. Off to the left is the new eco forest, and to the right the Singapore Flyer (a wheel bigger than the London Eye), and the reflective silver roofs of the theatres on the bay. The V Hotel in Bencoolen Street is surrounded by construction of a new tube station. The walls are thin and on New Year’s Eve we get no sleep at all. Personal reminder: never stay in major city hotel on New Year’s Eve. Strolling out down Bras Basah Road, we grab a beer in the oddly named Chijmes complex (it’s an acronym of Convent of the Holy Infant Jesus – a converted convent). Then down North Bridge Road to Boat Quay for a curry, sitting on the waterfront watching the laser show from the top of the SkyPark Towers and watching the boats cruising up and down. We finish off with a nightcap in the Billiard Room bar of Raffles, which is empty. The next day we take a leisurely wander down past the Cricket Club to the Fullerton Hotel – another pleasant spot to have lunch on the terrace and watch the world go by. Dinner in the courtyard of Raffles rounds off a pleasant couple of days before heading off to Sri Lanka. Round two in Singapore sees us flying in from Sri Lanka and arriving at 3am. Construction work at the airport in Colombo has forced them to squeeze all the flights into early morning and late evening. But things go smoothly and there is barely anyone at immigration, so we are at our hotel and in bed by 4am and sleep till midday. It’s the Shangri-La in Orange Grove Road – the old classic with scalloped balconies all containing flowers. This part of the trip enables Sarah to visit her old stomping grounds. The American Club is undergoing huge reconstruction, with little but the old snug bar left of the old set up. The Tanglin Club next door shows more of what these huge clubs represent – a huge swimming pool, multiple restaurants, tennis courts, bowling greens, and thousands of warring members. Wandering around this part of town confirms the extraordinary consumerism in Singapore. It’s a concrete jungle full of opulent brands, with effectively no local culture on display at all. Maybe this is the local culture. We take a trip out to the zoo. It’s fine but isn’t as impressive as both of us remember from previous visits 17-20 years ago. The larger animals in particular don’t seem to have the big areas to roam in that we recall, even though in theory there is plenty of space. 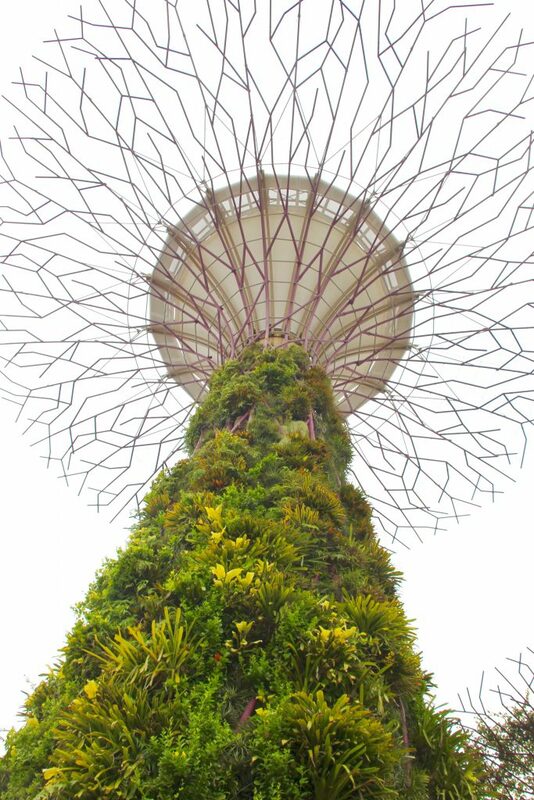 We head across town to the Marina Bay Sands area, starting in the Gardens by the Bay, home of the space age super trees. They are interesting, and the whole thing represents an excellent attempt at eco-friendliness, based as it is on a biomass system run from all the tree clippings of the city, recycled to neutralize carbon emissions. In the mix are various biodomes with plants from around the world, and lakes sporting enormous silver sculptures of kingfishers and dragonflies. If you are okay with heights, you can go up the walkway and view things from a couple of hundred feet up. It’s alright, but not as dramatic as one might expect, and arguably the most impressive view is from a distance when first driving into town from the airport. We find our way through a network of concrete pathways to Tower 3, and go up 57 floors to the bar at the top, where you can survey the full urban landscape. Out to sea, probably 1,000 ships await entry to the massive docks. Inland, it’s skyscrapers pretty much all the way. Singapore is clearly a thriving nation with a significant orderly streak. Everything is clean. It all works. Transport is effective. Cab prices are low. There is every form of service and product imaginable. And it’s all pretty bland. Despite a huge blending of cultures and religions, there is precious little character to be found here. Old vestiges of colonial buildings provide welcome relief from the endless concrete, and there are a reasonable number of green spaces to break things up. But the rest is just one big air-conditioned shopping centre leading to another, interspersed by an expressway or busy road. 10 out of 10 for prosperity and efficiency; 2 out of 10 for character.